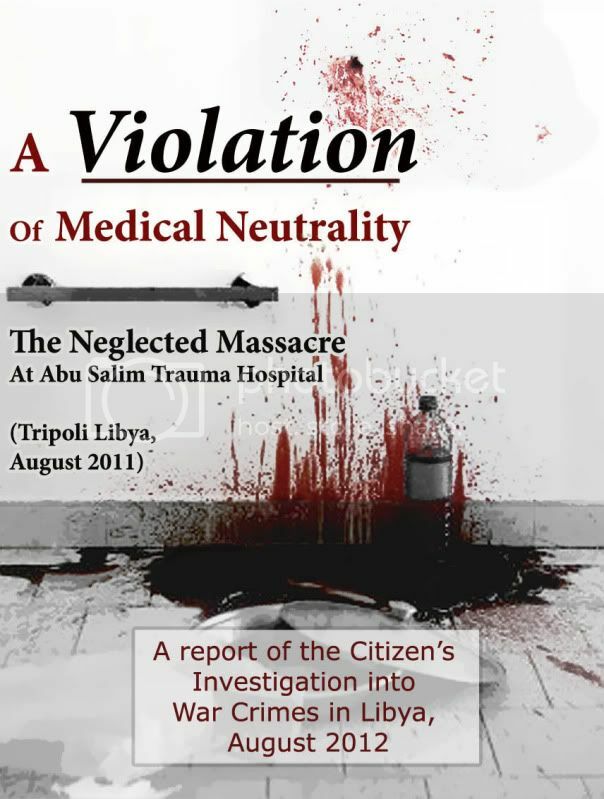 The following is a sub-section of the report "A Violation of Medical Neutrality: The Negelected Massacre at Abu Salim Trauma Hospital." 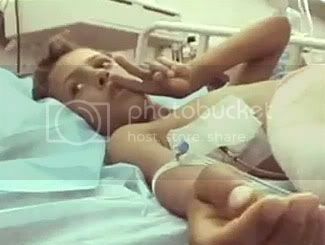 The report is nearing completion on schedule to mark the approximate anniversary of the hospital massacre - same day this kid allegedly had a bullet removed from his chest there. The Euronews video shows Mohammed’s unnamed father clearly overcome to an unnerving degree. It looks like relief, sudden joy, and perplexity all mingled, and still shaped by days of sorrow and worry. It’s all directed far more at the cameras than at his son who lays three feet away, once again just waiting. [E1] This scene was witnessed by Channel 4’s Alex Thomson as well. 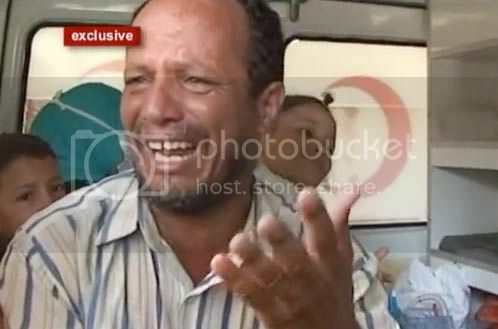 Perhaps not knowing the back-story, he decided “in one ambulance a man, almost incoherent with fear, just kept saying: “Al Hamdillulah” – thank God. Three young children sat near him almost beatifically calm in their shock.” [AT4] One of these children was of course Mohammed, and his little sister can be seen briefly, in the Euronews video, smiling at the strangeness of this family trip (visible in the still above, along with a younger brother, it seems). [E1] Mohammed doesn’t speak or show any emotion in the available videos at all, “in too much pain to talk,” one of them explained. All this together merits a flashback to Misrata, about four months before the events in Tripoli. 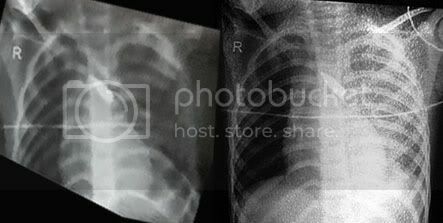 “The Sniped tykes of Misrata,” an early investigation by the author, exposed transparent rebel propaganda based on fake x-ray images. [STM] These were said to prove at least two children, a 4-year-old girl and 5-year-old boy, were both shot in the chest by government snipers. The boy’s film was shown by Human Rights Watch, alongside the victim, his bandaged wound, and his mother. Then a copy of it was quickly spotted in a video - presented as an image from the girl’s chest. The “removed bullet” was shown in a vial, alongside the film and a sleeping girl. [STM] Below, the two images compared – left, the girl’s film, skewed to proportion, and right, the boy’s. Tripolitanian Mohammed allegedly suffered the same fate, a sniper bullet lodged in the chest, just as the Misratan rebels entered the capitol. They also brought their public relations tricks. Sniper-shot kids and nice endings injecting “rays of joy” are both helpful. His X-ray film wasn’t shown, but it’s entirely possible the CIWCL already has two copies of the one someone might have considered showing. The best view for assessing Mohammed’s injuries is an AFP video that shows him shirtless, carried onto a gurney. His back is seen obliquely, and his chest from all sides, all revealing no mark anywhere aside from the bandaged area on his mid-right side, a drainage tube attached. [FP2] This is arguably “the back,” by now apparently the entry wound and the point of surgical extraction (suggesting the bullet didn’t lodge itself in very far). There being no exit wound is consistent with the bullet needing to be removed, as it reportedly was, with surgery performed at Abu Salim hospital on or after the 21st, just about the same time most of the staff was reportedly fleeing. Mohammed was thus apparently there the whole time, and like the others, has nothing to say, or even gesture, suggesting there was a mass-killing in that time. By seeing no such thing, he’s another witness for the questionable rebel version of what happened at the trauma hospital. Considering this and the problems laid out above, it’s clearly worth wondering if he was ever shot at all, and whether he was truly there for days waiting for rescue. Perhaps he and his story were simply placed there on the 25th, prior to Simmons’ guided tour.